What Makes a Great Trolling Motor? “Don’t scare away the fish!” is probably a phrase you’ve heard in many of your angling experiences. Avid anglers know that being quiet and still on the water is an essential part of luring in a great catch. But being stealthy can be a difficult task to achieve when you’re in a motorboat; many regular motors are loud and clunky, which alerts underwater fauna to your presence. To avoid spooking fish, trolling motors are a great option to have on deck. In this article, we’ll walk you through what a trolling motor’s purpose is, what makes them admirable, and some great options for anyone looking to purchase one. A trolling motor is a small, electric motor that can be attached to the front or back of a boat. These devices are used most often in fishing because they are quiet and can propel a watercraft through a body of water without alerting fish. 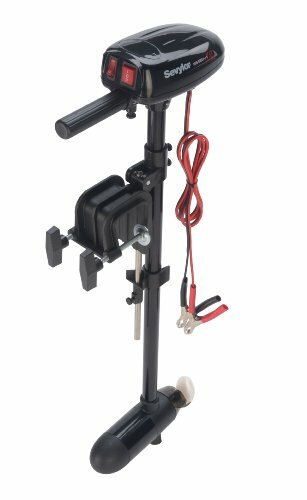 Trolling motors are great not only for anglers but also for anyone who spends a great deal of time on the water. These products are a great back-up motor in case of the main motor failure, and can even be used as a main source of power in a small boat. An easy way to move your boat a short distance in between fishing spots without using main power source/alerting fish to your presence. Gives you maximum control over your potential catches by allowing minute changes in position in the water. Offers peace of mind in the form of a backup power source. In some states, mounting a trolling motor to your small boat which wouldn’t otherwise need to be registered, makes the watercraft require a registration. 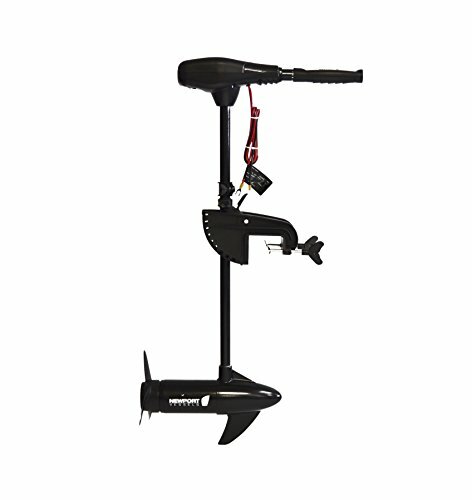 There are two major styles of trolling motors available: a bow mount and a transom mount. 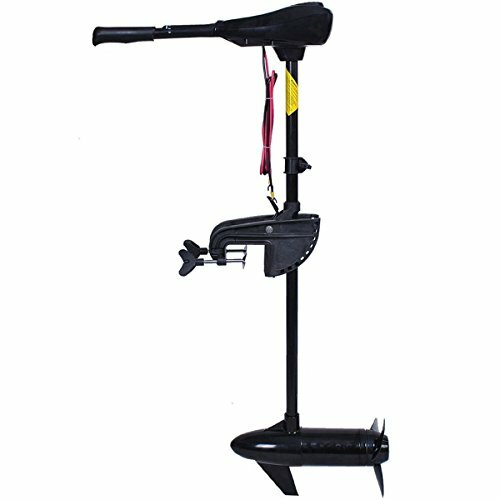 A bow mount trolling motor attaches to the front of a boat. This setup requires sufficient space at the bow where the motor will perch, as well as some sort of mounting bracket to append the device. Bow mounts are desirable because they effectively “pull” a boat through the water, allowing for maximum control and ease. In general, this style of trolling motor is limited because a watercraft has to be around 15 feet or longer to accommodate for the space it requires. A transom mount trolling motor attaches to the back of a boat. This is the most common style, as it can accommodate boats of all shapes and sizes. It can clamp onto a stern with limited effort from the user. Though a transom mount can move boats effectively, its positioning doesn’t allow for as much control and maneuverability. There are many aspects of a great trolling motor to consider when you’re thinking about making a purchase. ​Electric motors usually have a voltage between 12 and 36 volts. The higher the voltage, the more powerful the motor. Pounds of thrust relates to voltage in the sense that, the higher the voltage, the higher the thrusting capabilities. The larger your boat is, the more voltage/pounds of thrust it requires. ​Ensure that your trolling motor’s shaft is long enough to fully submerge the prop (around one foot of water). This will depend on where your motor is placed -- typically, it’s at the front of the boat, it requires a longer shaft. ​There are several different methods of steering, depending on the style of your motor and your own personal preference. Hand and foot control motors are associated with bow motors and both have advantages and disadvantages; it really depends on your own wants and needs. Tiller steer motors are also an option and are easiest to install. If you want to purchase a trolling motor, but not sure where to start, visualize your watercraft and analyze the nature of your fishing activities to decide what qualities you want the motor to possess. The following products are a great place to begin. 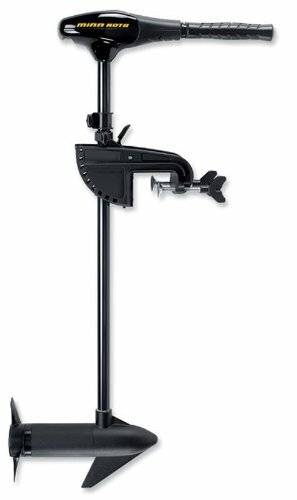 The Minn Kota trolling motor is a small but mighty transom motor that is great for smaller fishing boats. A very popular choice among freshwater anglers, it has 12 volts of power and a thrust level of 30 pounds. It’s super quiet and allows for stealth on the water when it matters the most. For control, there are eight different speeds, five forward speeds and three reverse speeds. It’s constructed with a durable composite material that can withstand a little bit of roughhousing. This motor is mounted with a lever-lock socket and offers tiller steering with a six-inch telescoping handle. This tough little motor is a great option for anglers who have small boats, dinghies, fishing canoes, or kayaks, etc. It’s super easy to set up and can attach to a variety of watercraft without much effort. This motor has been praised for its ability to take a beating, so you can rest easy knowing if it gets whacked a couple of times, it should hold up. If you have a larger boat, skip this motor and go for something with more thrusting power. With 55 pounds of thrust capability, the Newport Vessels trolling motor is one that works well for small and medium-sized watercraft. It’s a transom motor and features an extendable six-inch handle for steering. It offers eight different speeds, five forward and three reverse. Because the motor is created using stainless steel, magnesium, and zinc. It’s suitable not only for freshwater, but saltwater as well. A 30-inch adjustable shaft gives anglers the opportunity to fine-tune the length to what is necessary for their boat. In addition, the three blade propeller is made to ensure limited drag on the water. The Newport Vessels trolling motor gains major points in a couple of areas, but mainly for versatility. The hardware works well in both freshwater and saltwater and can accommodate a variety of watercraft sizes thanks to its transom style and adjustable shaft. However, some users complain about the transom mounting mechanism, as some of the hardware is made with plastic, which is not as durable as the motor and shaft material. Gliding through water quietly is a breeze with the Goplus electric trolling motor. Goplus offers three different motors with different thrusting abilities, 46, 55, and 86 pounds. This variation in capabilities allows the user to accommodate their needs, depending on the size of their watercraft. This transom motor includes eight different speeds, five forward and three reverse. The shaft and handle length are both easily adjustable, and can accommodate a large range of boat sizes. It has been approved for both freshwater and saltwater use and is created using a fiberglass composite and aluminum. A three blade propeller helps the device cut through water quietly, limiting drag. Goplus offers some great trolling motor options for a great value. With three thrusting power sizes to choose from, you can easily pick what will work best for your watercraft. The aspect of a Goplus motor that makes it desirable is its power capabilities. Though it may seem small, it is mighty. To add to that, the battery power is also long-lasting, giving you peace of mind when you’re on an all-day fishing trip. Cloud Mountain offers seven different thrusting options for their transom style trolling motor, ranging from 36-86 pounds, with tons of variation in-between. Similar to the previous motors mentioned, this trolling motor has an eight-speed capability, with five forward and three reverse speeds. It’s crafted with fiberglass composite, making it suitable for freshwater and saltwater boating. The shaft length measures in at 28 inches and is adjustable to the length required for your boat. An LED power reader on the back of the motor allows the user to see how much juice they have left on the water. For someone on a budget, the Cloud Mountain trolling motor might be the right pick for you. It’s versatile and has lots of great options in terms of thrust power, allowing you to pick and choose what will work best for your watercraft. It does have some plastic hardware, which is not ideal when it comes to trolling motors. Because of this, you may have to buy your own mount or alter the one it comes with. It’s a transom motor with four different speed settings, two forward and two reverse, but it can also be mounted to a bow if the boat is equipped with bow eyelets. The motor is super lightweight and easy to transport to and from the boat if needed. The 18.5-inch shaft is adjustable and made with aluminum. The propeller is two-bladed and designed to avoid getting snagged on pesky underwater foliage. The Coleman trolling motor will work best for you if you’re looking to modify a small boat or fishing kayak. It has limited thrusting ability but works well if your watercraft is not super heavy. Though there are some plastic parts of this motor which are not as durable as fiberglass or a composite, users say that it pretty tough considering the material. This is a great trolling motor to travel with. Operating a trolling motor will depend on which type of motor you’ve purchased. For transom motors, which we’ve focused on in this article, the setup and use are generally very easy. Measure the distance between the motor and water to ensure that you adjust the shaft of your trolling motor enough for the prop to be submerged in at least one foot of water. Then make the adjustment. Attach the motor to the back of your boat by using the mounts provided. Ensure it is as tight as possible. Switch on the power and change speeds by adjusting the toggle or lever. Make sure the prop is fully submerged before operating the motor. Using a bow motor is very similar, the only difference is the set up is on the front of your watercraft. 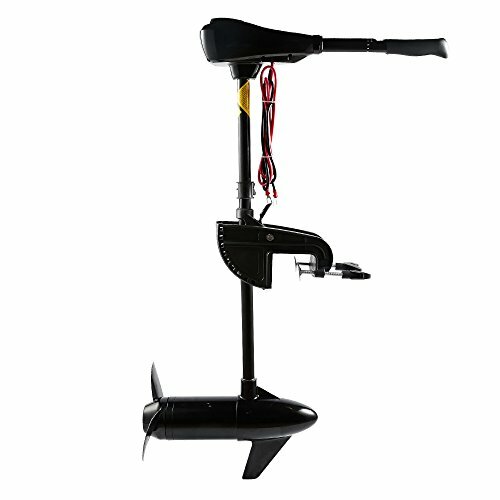 Many bow trolling motors have either foot or hand controls, giving you more control over the speed. The video below demonstrates the use of a bow trolling motor. Trolling motors are a great addition to any fishing boat. They allow you to fish a variety of areas with ease and safety, keeping your boat silent in the process. There are no shortage of options when it comes to your first purchase; keep your boat size in mind and know that the first one won’t always be the right one. Troll away!